Baby Driver? What is that? Baby Driver is the latest film from Writer/Director Edgar Wright, who you may know from the excellent trilogy of Simon Pegg & Nick Frost buddy films dubbed the “Three Flavours Cornetto trilogy“. Those films were Shaun of the Dead, Hot Fuzz and The World’s End. You may also know Mr. Wright from the Videogame-inspired Comic Book adaptation Scott Pilgrim vs the World. Baby Driver tells a fairly basic and straightforward story about a kid who got caught up in a life of crime due to some tragic circumstances. “Baby” as he is called, happens to be a superb driver. Hence the title… Baby Driver. It’s also the name of a Simon and Garfunkel song that I could guess that the film drew some inspiration from. What unfolds across the screen is a standard-fare crime/action/comedy. The “X-Factor” is that it was written and directed by Edgar Wright. Edgar infuses each scene with music, much in the way James Gunn has done with his Guardians of the Galaxy movies for Marvel. In fact, Baby Driver could almost be an alternate universe vision (a “What If”) of what would have happened to Peter Quill if he wasn’t abducted by Yondu and had remained on Earth. Baby always has his iPod on him and is constantly listening to his playlists, which make up the majority of the film’s audio track. The audio is driven by music and the visuals are driven by action-packed car chases. Those cars are driven by Baby. 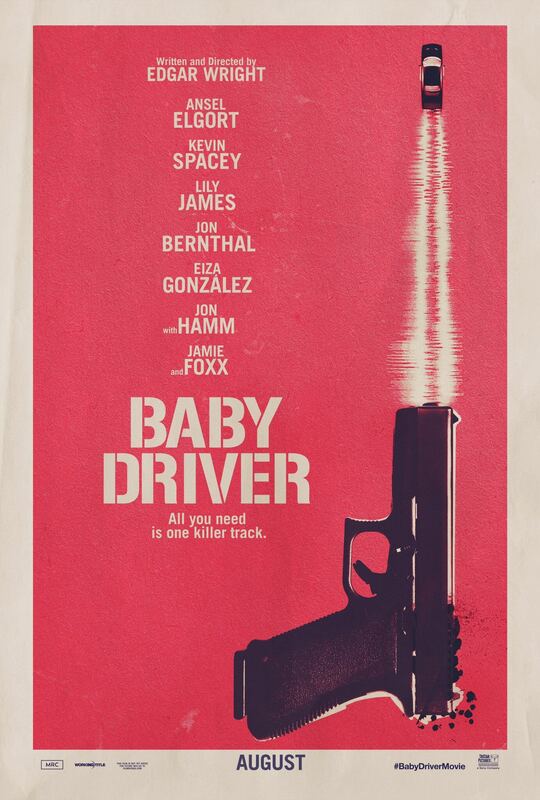 Baby is played by Ansel Elgort (the Divergent series, The Fault in our Stars) and he joins a great cast of colorful criminals in Jon Hamm, Jamie Foxx, Kevin Spacey, Flea, Jon Bernthal, Eiza González, and Lanny Joon. Lily James (Cinderella, Downton Abby) rounds out the cast as Baby’s love interest Deborah. If I had to point out a weak spot in the cast, it would be the combo of Baby and Deborah. I only mention this because of the strong relationship work that Edgar had previously done in his Cornetto Trilogy. While not a romance, the relationship chemistry between Simon Pegg and Nick Frost carried three whole movies. I did not get that vibe out of Lily and Ansel. They weren’t bad… they just weren’t at the same level as Pegg and Frost. The cast of criminals were a lot of fun. They were almost cartoonishly vibrant, very much in line with the supporting characters in all of Wright’s previous work. In fact, this literally felt like an American version of an Edgar Wright film. Funny, since that exactly what it was. In short… go see this movie. I know it will enter the rotation of being one of my favorite films, just like all of Mr. Wright’s works.